by Jim Griffith, Bill Easum. Chalice Press, 2008. These two coaches/consultants want you to learn from the mistakes that others have made. Not only is there no reason to reinvent the wheel, there is no reason to reinvent the Pinto (a not so great car from long ago). You will read about the hazards of launching too early. You will learn that avoiding money conversations delays disappointment. You will gain insight as to why it is best not to formalize leadership positions too soon. Don’t take the noted mistakes literally. Read for the nuance. 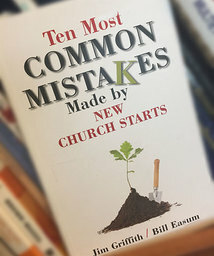 For example, as you read, ask yourself, “How does this example fit or not fit my context?” This book helps you as a church planter to focus on the most important things. As you gain insight, you will be less likely to focus on nonproductive tasks. As the writers remind us, church starts aren’t just about starting a new church. That is their end goal points beyond the new organization. New congregations are about sharing the love of God with others. Get is this right and, as the authors assert, you will avoid a lot of mistakes.